Nothing is better than pizza from freshly milled, stone ground flour. Especially leavened with a natural starter. Have you been looking to cultivate one or have questions on keeping yours alive? Start here over at The Kitchn. Once you have a predictable, billowy and healthy starter going you're ready for some pizza! This version uses Carolina Ground Type 75 bread flour for a chewy, nutty, mostly whole grain crust. Preferment: Mix by hand. Ferment 8 to 12 hours at 72 degrees. 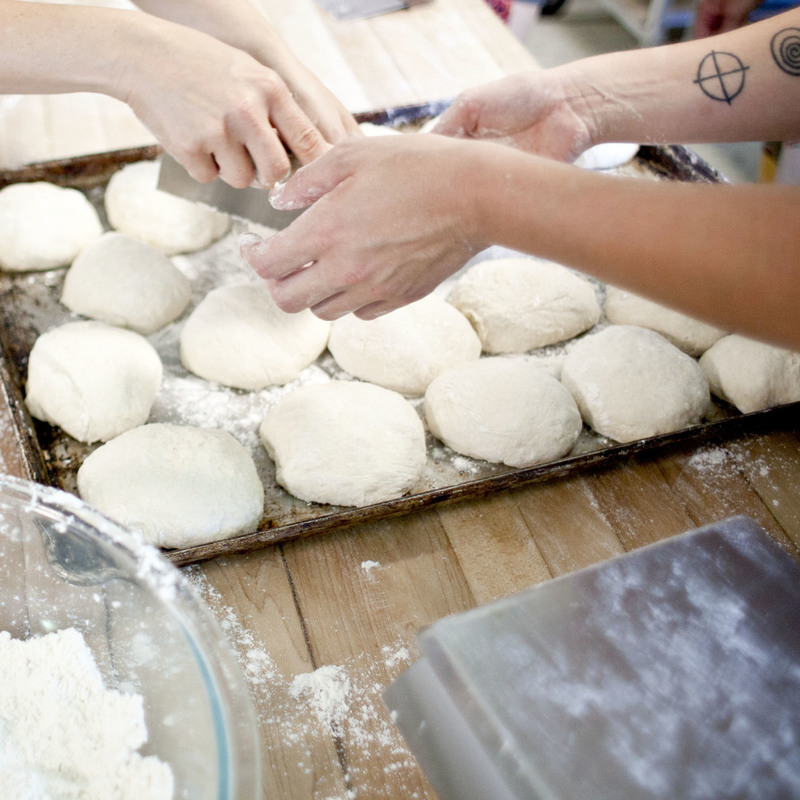 Dough Mix: Mix by hand. 30 minute autolyse. DDT 77 degrees. Bulk fermentation: 4 hours, 3 folds, 60 minutes part. Divide on hour from the last fold. Shape into 10 oz. rounds. No bench rest. Transfer directly to a sheet pan or dough tub dusted with flour and cornmeal. Proof at room temperature (72 degrees) for 2 hours then retard at 45 degrees up to 72 hours. Pull out of refrigeration an hour prior to baking. Position a rack in the middle of your oven and remove the extra racks. Place your baking stone on the rack and preheat to 500 degrees. Allow the stone to become thoroughly hot. Dust your peel with cornmeal; this will make it easy to transfer the dough to your baking stone. Take your ready dough and lightly dust with flour. Place the dough, flour side down on your peel. Gently press into a circle, making an indent ½ inch from the edge to form your crust. You may also take the dough in your hands, and using the back of your hand gently separate from the middle outward. Let gravity do some of the work for you as well. Place back onto the peel. Since we have worked so hard to properly ferment our dough I stay very simple with toppings. This allows you to appreciate the flavors in the crust and the delicious reactions between dough and heat. Brush your dough with olive oil or sauce of your choice. Distribute cheese evenly and lightly top with your prepared ingredients. Give the peel a “shimmy shake” and make sure the pizza is loose and will slide off the peel. If it seems stuck or dragging, lift up and toss more cornmeal underneath. Open your oven and slide the pizza onto the waiting stone. Bake your pizza for 10 to 12 minutes, depending on how strong the heat in your oven is. I also like to broil it for the last 2 minutes of the bake to get a blistery, slightly caramelized crust. Check the bottom of your crust. If it has started to darken and char it is done. Use the peel to transfer it from the oven to a cutting board. Cut into wedges and enjoy!